In the most basic sense, a subpoena is a request for evidence to use in a criminal case. The court issues subpoenas to individuals who can provide this evidence, which can be anything from a testimony about an event to a document that shows critical information about the event. A subpoena is not a summons. It does not mean that you are facing a lawsuit or that you are the subject of a criminal investigation. A subpoena is merely a request for evidence, and this request may require you to appear in court. Failure to comply with the terms of your subpoena is an act of contempt of court, which can have criminal penalties. You can be required to pay a fine or face other penalties for failing to comply with your subpoena. In most cases, the court holds a hearing to determine whether the party did actually commit an act of contempt of court. At this hearing, the party may explain why he or she did not comply with the subpoena. 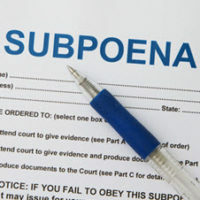 There are two types of subpoena you can receive: a subpoena ad testificandum, which requires its receiver to provide testimony to the court either in person or via telephone, and a subpoena duces tecum, which requires its receiver to provide physical evidence either to the court or to one of the parties involved in a case. Every American’s right to avoid self-incrimination, guaranteed by the Fifth Amendment to the Constitution, often comes up in discussions about subpoenas and the legal requirement to comply with them. You have the right to refuse to provide testimony or documents that incriminate you in a criminal investigation and if the testimony or documents you are asked to provide can potentially implicate you in the alleged offense, you can find yourself facing a dilemma. At this point, contact a criminal defense lawyer to discuss your rights and options for handling the subpoena. Your lawyer can help you prepare your testimony to provide truthful information without incriminating yourself. Do not provide a false testimony in an attempt to avoid self-incrimination. You do not have the right to destroy documents requested through a subpoena, even if these documents incriminate you. Give your lawyer any documents you are asked to provide to the court before passing them onto the court. Your lawyer can review them to determine how best to handle the request. If you have received a subpoena, you need to comply with its terms. If you are not sure how to do this or if you think compliance could potentially incriminate you in the criminal case, speak with an experienced criminal defense lawyer about how to handle the request before you move forward with it. Whatever you do, do not ignore the subpoena. Contact our team of experienced Miami criminal defense lawyers at Ratzan & Faccidomo, LLC today to set up your initial consultation with us.